Last summer our family were lucky enough to attend several Highland Games, each steeped in Scottish tradition with its own unique qualities between village and town. Nairn Highland Games is one of the largest Games in the area, next to the beach and is free to attend. Events include the Highland traditions such as tossing the caber, throwing the hammer and tug o’war, plus running and other athletic track sports. Hundreds of Pipers march in unison through Nairn’s streets, heard in the distance and become spine-tinglingly dramatic as they approach the games’ fields. It isn’t long before the men in kilts are flexing their muscles and launching huge log (up to 11 stone) along the field away from them for it to land as close to the 12 o’clock position as possible (the distance is irrelevant). Then they are spinning around and throwing the hammer as far as their strength will take it. 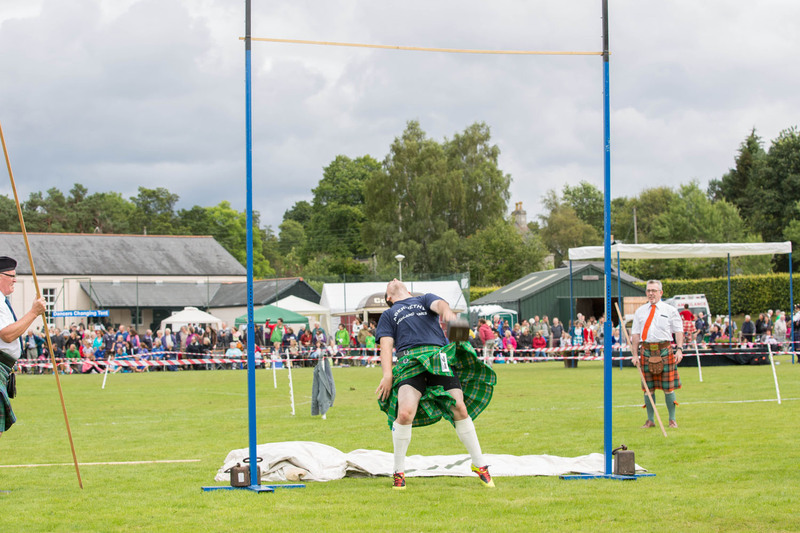 On the 18th July two very special Highland Games take place; Inverness which takes place in the world’s first purpose built Highland Games stadium, built in 1864, will take your breath away as it is steeped in tradition and scale! Tomintoul Highland Games on the same day is one of the most traditional events. Set high up in the north of the Cairngorm mountain range, Tomintoul is surrounded by breath-taking scenery. This year Muckrach will be participating amongst the stall holders at Tomintoul Highland Games, offering samples of our menu from the BBQ. There are many other Highland Games held around the Highlands during July, more details can be found here. The Abernethy Highland Games on the 8th August, is just down the roads was equally enjoyable, although smaller, the Pipe Bands were still as compelling, the sporting events as enthralling and the general atmosphere was friendly and family-oriented. This year, Muckrach will be part of the Abernethy Highland Games held in Nethy Bridge just 4 miles from the hotel. Although we won’t be tossing the caber or conducting a Highland fling, we will be there again offering samples of our menu from the BBQ and generally soaking up the amazing community atmosphere. We’re also looking forward to Grantown on Spey’s Highland Games on 23rd August (only 6 miles down the road from Muckrach) and many more before then. If you’re in the area we highly recommend attending at least one of the many special events in the area, they are genuinely inspiring and fun.